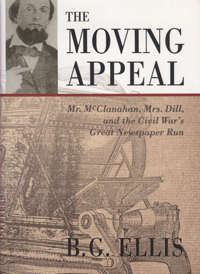 The Memphis Daily Appeal rallied civilians and soldiers in the Deep South from Fort Sumter to Appomattox, thanks to its doughty owner John Reid McClanahan and scheming staffers Carolina Dill and Benjamin F. Dill. Their scrappy backgrounds enabled them to exasperate and outwit generals Ulysses S. Grant, William T. Sherman and James H. Wilson who chased them across four states, yet never could silence the "Voice of the Confederacy". That took McClanahan's post-war murder and Dill's immediate and mysterious death—and Mrs. Dill's stealing the paper and its profits. Gypsying around five towns—Memphis, Tennessee, Grenada and Jackson in Mississippi, Atlanta, and finally Montgomery, Alabama-the national paper had several affectionate nicknames, among them "The Moving Appeal", "The Greatest Rebel of Them All", The Bible of the Confederacy", and "Old Reliable". Yankee officers labeled it either "that damned Rebel rag", or "hornet's nest of the Rebellion". But they and their men still read it avidly because it was a far superior news product than officers' announcements, out-of-date and biased Northern publications, or camp newspaper accounts about what was happening at home, on battlefields, and in the hostile countryside they occupied.